How do I connect to web services outside of Canvas as an instructor? Canvas is integrated with a number of third party web services. 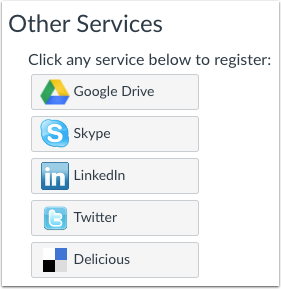 Most of these services can be configured from the user settings page. When you register other web services with Canvas, you can integrate your account with services you already use. Each of these services also generates a contact method for other people in your course or group. 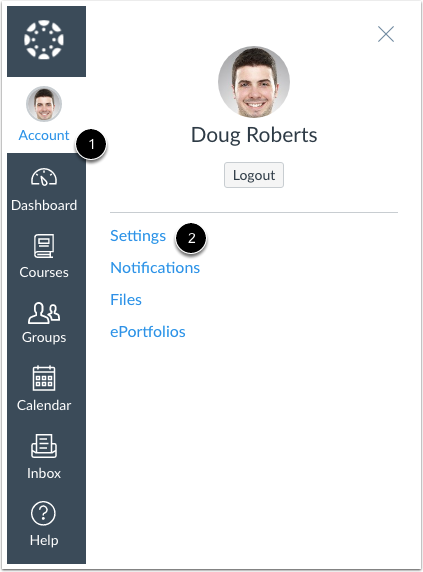 If Profiles is enabled for your account, and you want to show any of your registered web services on your profile page, click the Let fellow course/group members... checkbox. You can select specific services to display by editing your profile. Note: If you do not have a profile page, your institution has not enabled this feature. Previous Topic:How do I grade a graded discussion in SpeedGrader? Next Topic:How do I connect to Delicious as a web service in Canvas as an instructor? Table of Contents > Web Services > How do I connect to web services outside of Canvas as an instructor? Re: How do you manage registered services. Re: Under my BIO it says contact. How do i get my email to show up here?